“The Pastor as a Teacher.” Journal of Modern Ministry 5.2 (2008): 69-84. 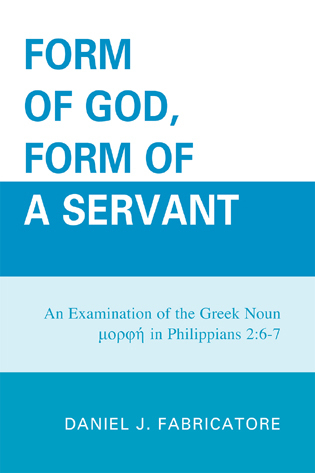 Form of God, Form of a Servant: An Examination of the Greek Noun μορφή in Philippians 2:6-7. Lanham, MD: University Press of America, 2010 (paperback published 12/30/09). “A Lexical and Exegetical Examination of οἰκονομία.” A paper presented to the Council on Dispensational Hermeneutics, September 2010. You can read it here: οἰκονομία. 2010 Council on Dispensational Hermeneutics. The Resurrection of the Dead: A Theological Exposition of 1 Corinthians 15. Another project in the works is a book on death and the believer. Both of these projects are hopefully going to be complete during a post-doctoral sabbatical at Tyndale House, Cambridge next summer (June-September, 2019).